Google India has launched 'India Get Your Business Online', a first-of-its kind program that offers free websites, domain and hosting services to small medium businesses (SMBs) in India. The program has been designed with the help of local partners and will provide Indian businesses with the tools and resources to establish a website, find new customers and grow their businesses. "Out of an estimated 8 million SMBs in India, as of now only about 5 per cent have a website, hence this program will bridge the information gap that exists online due to the lack of presence of local Indian businesses on the Internet," wrote Rajan Anandan, MD & Vice President, Sales & Operations, Google India in a blog post. 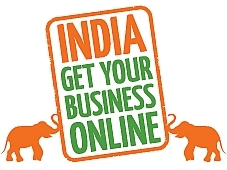 Small business owners in the country can simply logon to www.indiagetonline.in and use the tool to get a free website and web hosting for one year (that is powered by HostGator). Businesses will also get a customized domain .in name and free tools, training and resources. HostGator will also offer free support in creating, hosting and managing the website for a period of one year through its toll free call centers. Google plans to help 500,000 SMBs in India to get online in next three years through this program. The website is free for a year after which SMBs will have to pay a nominal charge if they wish to renew their domain name, although they can also cancel their website at any time. SMBs will also have to pay a monthly charge to maintain their website using HostGator. Setting up a website is free, additionally the domain and maintenance is also free for a year. The website tool doesn't take a lot of time and all that is required is the user's address, phone number and TAN/CIN or PAN for verification purposes. Other features include photos/logos; integration with social media platforms; and a Google Apps account with free personalised email ids. Additionally, free tips and tools will be provided from the Getting Indian Business Online team and Google AdWords will also provide a free coupon that is worth Rs 2500 for the promotion of the website. The initiative will definitely help SMBs scale up their businesses because an online presence provides them the opportunity to connect with a much larger customer base. On the other hand, it is a win win for Google too because the company has the opportunity to rope in potential future advertisers in the form of the SMBs that register themselves with the program.